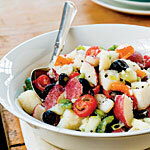 GS cooks : Skinny potato salad! I don’t know about you but summer just makes me want to barbeque and grill everything! Eating outside, with friends, and having some good old clean American fun is what it’s all about. But, there are some definite fat traps that lie lurking at every barbeque. One of the BIGGEST offenders is the classic potato salad. It may have “salad” in the name, but this side dish is a calorie BOMB. While potatoes aren’t bad for you at all, its the gloppy mayo that is thrown into the dish that makes it so pudge-inducing. The average cup of potato salad contains about 358 calories, 20.5 grams of Fat, 170 mg of Cholesterol (57% of your daily value — how much cholesterol you CAN eat in a day), and a whopping 1323 mg of sodium (also more than half the recommended daily value for sodium). That’s just gross. So I did a little research, and found the most delicious, amazingly yummy, healthy potato salad out there. And the best part? No mayo whatsoever (the recipe uses a vinaigrette made with rice vinegar — a delicious sub!). And how do I know it’s that amazing? Besides having enjoyed it for the past 4 days now – my mom and dad devoured it the last time I made it, and D asked to eat the last bit left at 11 pm last night. So you know it’s THAT good. 3. Add potato to dressing in bowl, tossing gently to coat; let stand 15 minutes. Stir in cucumber and remaining ingredients; toss well. Cover and chill. I will eat this any time! YUM! !